Sistas in Rhythm is a Tulsa-based percussion and vocal ensemble that evolved from a weekly West African drumming class at Living Arts. We came together when asked to perform at the Sound and Spirit of Tulsa Benefit Concert at The Synagogue in 2011. The “Sistas” have all traveled extensively learning from teachers to include Grammy Award winners, Babatunde Olatunji and Gordy Ryan who played with Olatunji’s Drums of Passion for over 30 years. All members are deeply dedicated to spreading the power and connection to others through music. Using instruments such as jdun jduns, djembes, ashikos, shekeres, balafons and a variety of instruments from all over the world, the “Sistas” perform traditional African rhythms and songs, and much more! The Sistas in Rhythm are seasoned performers, teachers, and multi-instrumentalists. They are available for special events, performances, and drum circles, where all levels of hand drumming experience are welcome. See Videos and photos a the website. 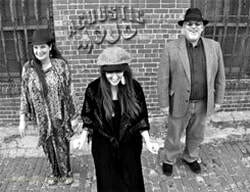 Acoustic Mojo is a creative contemporary folk trio, playing a mix of folk, blues, Americana and alternative genres featuring a majority of their own original songs. Members Di Burrup, Bryan Huling and Jeanie Stover are multi-instrumentalists covering vocals, guitar, mandolin, violin, djembe, flute, keyboards and free percussion between them. Creating a rich sonic palette, they strive to share their passion for music and songwriting in every performance. Another exciting element of each Mojo performance is the inclusion of several guest musicians. Featured performers include many of the most talented and original folks in our musical community. The sound created by Acoustic Mojo is both exciting and reflective. Dance along to the infectious groove of songs rich in rhythm, syncopation and energy. Experience the feelings of love, loss and reflection in original ballads infused with lyrical and musical imagery. Share in the social consciousness evoked in songs that give voice to contemporary issues important to us all.